Look! There’s Amazing Spider-Man #51 (August 1967) on the spinning comic rack! What a relief. For a time last issue, I thought that “Spider-Man No More!” stuff was for real. Not that things are looking up for Spidey on the cover of this one. I have very few specific memories of when I first read these early ASMs but I do have one for this issue. It was a Friday night and I was sitting on the couch in our basement. At the same time as I read the issue, I was watching my favorite TV show at the time, “The Time Tunnel.” It was the episode where Doug and Tony encounter Marco Polo and are captured by the Mongols. According to the episode guide at TV.com that episode is called “Attack of the Barbarians” and first aired on March 10, 1967. In case you’re checking up on my memory, yes, that date was indeed a Friday. But is it possible that an issue dated “August” came out in March? All I can tell you is that it did. I have a further recollection that I was pampering myself with Spidey and the Time Tunnel because I was sick but I can’t swear to that… and none of you care a whit about that anyway. So, let’s recreate the moment, get into our PJs, fire up the Time Tunnel DVD, and dive into ASM #51. Articles: Betty Brant, The Big Man, Gwen Stacy, Jameson, J. Jonah, Kingpin, Mary Jane Watson-Parker, Leeds, Ned, Robertson, Joe "Robbie"
Now, I know the fight is really heating up but we have to pause for the former “More Marvel Masterpieces…” page, known this issue as “On Sale Now!” because the whole page is devoted to one issue. And with all of the classic Marvel issues that have come out since the “More Marvel Masterpieces…” page started, what issue would finally warrant a whole page all to itself? Would you believe… Not Brand Echh #1? See the “Footnote” section for more about that. Now, back to the action. After bopping Big Turk, Spidey nails three guys using both arms and his right foot. “I sure hope you chaps didn’t eat heavy meals lately!” he says. Big Turk bails out with a guy named Shorty. “There’s always more where they came from,” Big Turk says of the guys they leave behind, “Besides, we gotta tell the Kingpin what we’re up against!” As Big Turk and Shorty peel out, the three hoods that Spidey walloped have turned the tables on him. One grabs his right hand, another tugs on his right arm, the third holds his left arm while trying to get him in a headlock. Spidey breaks free in the next panel, socking two of them with one big swing. There are three goons already lying on the ground, making a total of five in the panel. Add Big Turk and Shorty to the mix and it looks like Spidey was fighting seven guys altogether but there are never more than five shown in any panel. (Unless the whole seven are shown on page 5 panel 2 when Big Turk and Shorty take it on the lam… but the remaining bunch tackling Spidey look like a big blob… at least in my copy.) Spidey grabs two of his defeated foes and demands to know, “Who and what is the Kingpin?” but the police arrive so he decides to cut out. (Plus, it looks like the guys he’s interrogating are unconscious.) He climbs a wall to where he placed his automatic camera but, retrieving it, he recalls that he “told Jameson where to get off” in Amazing Spider-Man #50, July 1967. “Now I’ve gotta swallow my pride and convince him I was…ulp…only kidding!” he says. Back at the Daily Bugle, JJJ tosses newspapers into the air as he rages against Foswell’s disappearance. A black man stands by his desk and suggests they replace Foswell with Ned Leeds. (It’s only for one panel and he isn’t given a name but this is the first appearance of Joe “Robbie” Robertson.) Ned enters and tells Jonah he’s been working on the crime wave story for the past week. “There just aren’t any leads!” (Except for Ned himself. He’s a “Leeds.” Okay, okay, sorry!) Jonah tells him to “work on it night and day for another week” adding, “And find me a photographer to replace that punk kid Parker!” Which is when Peter makes his entrance, declaring himself “back.” But he can’t get away with it that easily. First Jonah has to rage at him, calling him a “the teenage traitor who walked out on me when I needed you most,” then telling him, “I wouldn’t take you back on a bet! You’ve been a thorn in my side since the day you first came here! Now gowan, get out! Go peddle your papers somewhere else! You’re through here!” This lasts only as long as it takes Peter to tell JJJ that he has pictures of Spider-Man. Then, suddenly, it’s “Can’tcha take a joke?” Jonah takes a look at the pix, thrilled to have shots that prove Spidey is back in action. “This is your lucky day, Parker!” he says, “I’ve decided to forgive you and take you back!” “No wonder they call you Santa!” Peter says. As Peter rides past “four men, entering [a] swanky private club,” his spider-sense tingles. He parks his bike and becomes Spidey, perching on the wall of a nearby building. He doesn’t see anything wrong but knows better than to ignore his spider-sense. (This time at least. He’s sure ignored it plenty of other times.) He peers into a window and sees the four men harassing the club’s manager. “One of ‘em is pulling a gun!” he notices (though the man and woman in the foreground of the panel don’t seem aware of it; they look like they’re having a wonderful time). Not wanting to waste any time, Spidey smashes right through the window (just imagine Johnny having to draw all of those little glass shards). He uses both arms to get headlocks around two of the men. A third one is knocked over from the impact. He gets right up, only to get kicked in the chin. The fourth guy takes a swing at Spidey and misses. The two men in headlocks have their heads slammed on the floor with a “Ftumpt!” Spidey lands on the wall and shoves one of the headlock guys who, apparently, is up already. “Charlie!” he yells, “Hurry up! Use the gimmick!” Spidey batters away at three of the guys. Unfortunately, Charlie is the fourth one and he’s “still standing.” Charlie pulls a miniaturized stun grenade out of his pocket and tosses it at Spidey. It knocks the wall-crawler to the floor and the four men run for the exit. (You’ve got to be impressed with these guys. They each took a pounding from Spider-Man but they’re up and running like nothing.) The club customers notice that the blast “weakened the beams” so that “the whole ceiling is about to fall.” The club manager blames Spidey, of course. Still woozy, the wall-crawler pulls out a spider-tracer and tosses it. It lands on the topcoat of the last escaping hood. He then gets to his feet and braces the main beam up until everyone gets out of the building. Then he leaps out the window as the ceiling comes down behind him. (Once he’s outside, it looks like the club was up on the second or third floor of the building. So, it’s remarkable that everyone got out on the street in such a brief time. You also have to wonder what the collapse of the ceiling on that floor does to the rest of the building.) The four men apparently have enough time to get to their car. Spidey swings above the street, following his spider-tracer. Meanwhile, four other men burst into J. Jonah Jameson’s Bugle office. (JJJ is working late and seems to be the only person left in the offices.) They draw guns on him and tell him “We’re takin’ ya for a nice little ride… to visit the Kingpin!” Jonah is startled enough that his cigar levitates a couple of inches from his mouth. “Brief minutes later,” the men have Jonah blindfolded and in their car. “This is insane!” Jameson says, “Nobody gets taken for rides any more except on the Untouchables.” But it isn’t long until he is ushered into the Kingpin’s office. JJJ is still blindfolded and cannot see Fred Foswell standing right behind the Kingpin. The Kingpin tells Jameson to “stop steaming up the public about the so-called crime wave” but Jonah refuses to be bullied. “I applaud your obvious courage,” says the Kingpin, “but alas you will live to regret it.” Just then, Charlie and the others burst in and tell the Kingpin that “Spider-Man kiboshed the caper.” (I love that the Kingpin’s men are the type of hoods who say things like “kiboshed.” Not, “put the kibosh,” mind you, but “kiboshed.” I also love that the Kingpin is the type of mob boss who says things like “alas.”) One of the hoods reports that “the whole joint caved in and [Spidey] was still inside! I figger we kissed ‘im off at last!” (It’s a nice touch that the guy who reports this is the guy with the spider-tracer on his coat.) The Kingpin accepts this but still has “another minor matter to dispose of.” “Foswell, would you be good enough to inform our guest that the Kingpin does not play games?” the Kingpin says. When Foswell wonders why he used his name, Kingy replies, “To be sure you do not try to betray me! Once it is known that you’ve returned to crime, you can never turn back!” Jonah, still blind-folded, gets so agitated that Foswell is with the Kingpin that little black quills come flying off his face. “You’re no better than that skunk Spider-Man!” he says. The gas does the trick. Spidey goes down on his hands and knees. Foswell is impressed. “You did it!” he says, “In just a couple of minutes, you actually defeated Spider-Man!” The Kingpin is not surprised. “I never fail!” he says. Jonah, still blindfolded and with those little quills coming off his head again, says, “Spider-Man beaten?!! It’s what I always wanted! But not now!! Not like this! !” And Foswell thinks, “With Spider-Man finished, what happens now? ?” I don’t know, Fred! But the bottom of the panel says, in big bold letters, “Next: To Die a Hero!” Ooh. That doesn’t sound good. On to the Bullpen Bulletins page (“Fabulous Facts and Frivolous Fables For Frantic Fans, Faithful Friends, and Fiendish Foes!”): Instead of the usual “Item” or “Didja Know?” designations, the four items this time are “Bombshell!” “Special!” “TV Time!” and “MMMS Madness!” So, what’s the bombshell? In case the full-page “More Marvel Masterpieces” ad didn’t sink in, it’s “The newest, most exciting, most daring mag that mighty Marvel has ever attempted… The name? Brand Echh!” And in case that isn’t enough for you, Stan goes on for a whole paragraph until he finally collapses into, “Don’t be a wreck – buy Brand Echh! Brand Echh! Branch Echh! Brand Echh! Brand Echh! Oh, and before we forget – the name of the mag is Brand Echh!” That should be more than enough but there’s even a little illustration at the bottom of the second column, advertising the comic. Is this the hard sell or what? But, wait, in spite of Stan’s claim that the “name of the mag is Brand Echh,” is it? Or is it “Not Brand Echh?” Let’s check the indicia of issue #1. Sonuvagun! There it is! “Brand Echh!” Let’s check the rest of the series. Look at that! “Brand Echh, Brand Echh, Brand Echh!” (I sound like Stan.) But then with #5 it becomes “Not Brand Echh” and stays that way through the run. Can you guess what the other item titles mean? “Special” plugs the annuals, now called specials, for 1967. They are Sgt. Fury, Millie the Model, Daredevil, Avengers, Fantastic Four, and Spidey. An interesting mix that shows that war and romance books were as popular as super-hero books back in the 60s. “TV Time” advertises the coming of the Fantastic Four and Spider-Man cartoons. “We’ll announce the premiere date real soon,” Stan says. Now more than 40 years later, you can pretend the premiere hasn’t happened yet and go read Kevin’s Lookbacks right here at Spiderfan! “MMMS Madness” reveals the “revised Merry Marvel Marching Society Membership kit” that includes a giant-size club pin, a recording of the MMMS marching song, stickers, a note pad, mini-books, a pencil, an MMMS certificate, and a membership card. Price is only 69 cents or 50 cents for current members. Stan says, “You’ll find a coupon elsewhere in this ish (and probably in the next million issues to come! )” and, sure enough, there is it above the start of the letters page. But before we move over there, we’ve got 26 more MMMS members to meet! Dan Jones of Oak Park, Illinois. Jim Hammer of Plymouth, Massachusetts. Anthony Goliszeski of New York, New York. Stephen James of Houston, Texas. Melvin Orser of Red Creek, New York. Pancho Koskoski of Donora, Pennsylvania. Bruce Rosenthal of Livingston, New Jersey. Alan Levenson of New York, New York. John Monestere of Hammond, Louisiana. Robert Rodrequez of Brooklyn, New York. (Did they spell Robert’s last name wrong or is it supposed to be with an “e” as listed here?) Aaron Earl King of El Paso, Texas. Gene Morrissy of Chicago, Illinois. Robert Glick of Morris, Michigan. Robert Ginggre of New York, New York. Shirley J. Noble of Hillmond, Saskatchewan. William Makuta of Valley Stream, New York. David D. Kimball of Lynnfield, Massachusetts. D. Machlenson of Montreal, Quebec. Randy Robinson of Double Springs, Alabama. Bob McKee of Bayfield, Colorado. Michael Hatt of Brooklyn, New York. Glenn Marcus of Brooklyn, New York. Eric Gray of New York, New York. Jerry McCollum of Centralia, Washington. Thomas Kirzka of Johnson City, New York. And Ken Landsperger of Trafford, Pennsylvania. I’ve pretty much exhausted all of what I have to say about these MMMS lists but, by God, I’m still listing them! In the Spider’s Web, Richard Gramlich and Bill Granatas of Hackensack, New Jersey have a few “petty complaints.” They think “Stan shouldn’t have so many words as in the recent issues. You have Spidey saying trillions of words while he is taking one step. The villain could have leveled his gun and polished him off before Spidey would stop talking! In issue #47…Spidey and Kraven are saying thousands of words in a micro-second while they knock each other’s brains out! John, could you try to put expressions on Spidey’s face when he’s hit even though his mask is on? How can Spidey climb walls and use his suction power when he has gloves and boots on?” Stan replies, “Petty complaints? That’s like calling the atom bomb a firecracker!” Joey Williams of Ypsilanti, Michigan thinks Peter has become too “hip and cool” and would like Stan to “cut out the following type of words – tiger, pussycat, pad, and a few zillion others.” Stan says, “the only reason we use the phrases you mentioned is because they’re pretty much in common usage today – and we strive mightily (albeit not always successfully) to relate to the contemporary scene.” (Seeing as I never heard anyone in the 60s use the terms “tiger” or “pussycat” I tend to think “not always successfully” is the operable phrase here. But these words immediately became such classic “Stan-isms” that I can’t see how anyone can possibly complain.) Finally, S. Alyne Weidler of Silver Spring, Maryland says, “Please get that red-haired maniac, Mary Jane, away from our hero,” while Warren Bluhm of Chester, New Jersey says, “keep Pete away from Gwen!” I bet Stan was loving every minute of it. Second appearance of the Kingpin but the first time Spidey fights him. First appearance of Kingy’s gas tiepin. First time Spidey insults Kingy with derogatory “fat” nicknames. And most importantly…first ever appearance of Joe “Robbie” Robertson! "In the Clutches of the Kingpin" - Spidey's first fight with Kingpin and his mob leaves Spidey defeated and captured. I love it when Spidey fights a gang of thugs. I love it when Gwen spars with Mary Jane. I love it when JJJ’s life is threatened and Spidey must risk everything to rescue him even though he knows Jonah will never change his mind about him. I love issues that end with Spidey in peril especially when they have a big “Next Issue” blurb that says something like “To Die a Hero!” So, it isn’t hard to figure out that I love this issue. There’s other great stuff here. Foswell’s return to crime, which almost seems like a reporter’s trick in Amazing Spider-Man #50 (he is the stoolie Patch as well, remember, so he’s certainly capable of deception), sinks in here and is a nice portrayal of a man justifying himself as he slips back into his bad old ways. The Kingpin himself is never as good as he is in these first issues. Fresh and exciting, unpredictable, imposing and powerful with that wonderful black-eyebrow scowl that Johnny gives him and those creepy wisps of smoke that snake off his cigarette in its holder. But there’s something I want to bring up about the Kingpin’s appearance that I’ve never seen mentioned anywhere else… maybe because it’s so darn obvious, I don’t know. Don’t you think Johnny was told that the new villain’s name was “Kingpin” and designed him after a bowling pin? 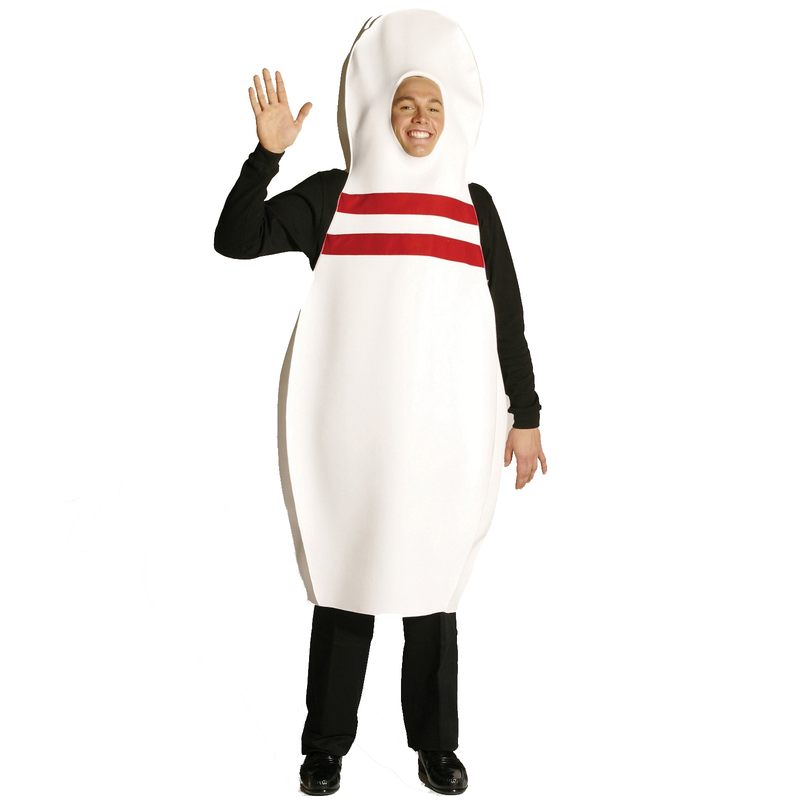 Or came up with the character himself after a long night of bowling? Take a look at this issue’s cover. Look at his bald head, his white jacket, the ribbon of vest (red on this cover) up around his neck. Now take a look at this guy, then look me in the eye and tell me you don’t believe it too. I give the Time Tunnel episode two and a half webs. It was pretty exciting but it always bugged me when Doug and Tony went to non-English speaking places, spoke English, and everybody understood them and spoke it back. This wouldn’t have been hard to fix. All they had to do was mention once in one episode that the Tunnel provided Doug and Tony with the ability to speak the language of any land and era they visited but no…Irwin Allen couldn’t be bothered with even the simplest explanation. Hell, why blame Irwin? All of 1960s TV was like that! As for the rating for the Spidey issue… come on. You know what the rating for the Spidey issue is. Five webs all the way. Next: So, Spidey’s in trouble! JJJ’s marked for death. Someone dies a hero! How can we wait? We’re getting to Amazing Spider-Man #52, September 1967 right away, right? Ah no, sorry. We have one stop along the way. Not Brand Echh #1 or Brand Echh #1 or whatever you want to call it. It’s next!